We just picked our last large batch of beets from the garden. I steamed the candy striped beets, red beets and golden beets and blended them with a mixture of bean and rice porridge (I used mung beans). I've started introducing new foods to my 9-month old baby Aria, and the natural sweetness from the beets works well for infants. It's pretty nutritious and filling for adults too, so I served the same dish for the family dinner but with a twist. I added pistachio paste for extra flavor and coarsely crushed pistachios for crunch. And for the dinner presentation, I topped the thick soup with goat cheese-infused cream. Who said "baby" food can't be delicious? There are still a few more days to enter the giveaway and maybe win a Teflon BBQ grill pan. All you need to do is enter your email address. I'll pick a winner on Monday, August 13th at 12AM. It's very easy to participate. Also make sure you're a fan of PhamFatale Facebook fan page and Teflon, or follow @phamfatalecom and @TeflonBrand and tweet about this giveaway. To make it easy, you can just copy and paste this tweet if you’d like: "The #giveaway is live! Enter to #win a BBQ grill pan from @phamfatalecom! What's your favorite meal to #grill? : http://bit.ly/MvWiVG" Good luck everyone! It's National Cheesecake Day this weekend and, though I’ve made many cheesecakes in the past, my goal was to put a new twist on the special dessert. Since we were invited to our friend Carol's home (she’s gluten intolerant), I decided to make my cheesecake gluten-free. I made the mousse egg-free and flavored it with both raspberries and strawberries. For a contrast in texture, I added a layer of crunchy, diced yellow nectarines. 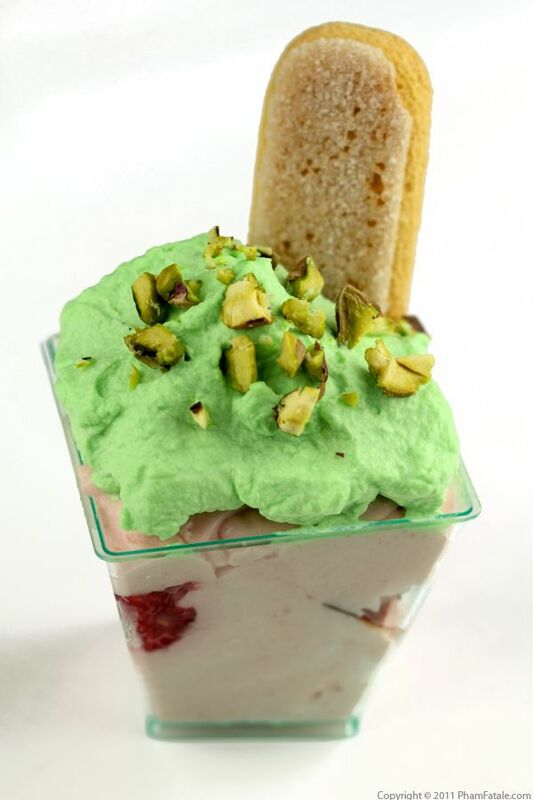 And to make it look more fun, I topped the dessert cups with pistachio-flavored whipped cream and crushed pistachios. I don’t think anyone missed the crust. For those who could eat gluten, I slipped a ladyfinger cookie into the verrine. How amazing does that sound? 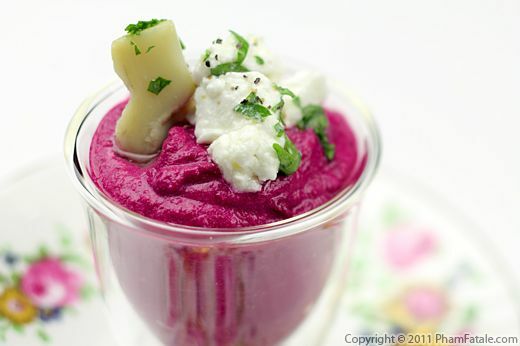 I’ve used the combination of beets and goat cheese several times, and I think that it works incredibly well. The color is so vibrant it only makes sense to use it as an appetizer. To brighten up the purée, I added marinated artichoke as a garnish and covered it in crumbled goat cheese as a hint of what’s inside. Just serve it in small shot glasses along with some tasty black sesame crackers, and you’ll have an easy appetizer that still brings the wow factor. It also goes great alongside the hummus that I published yesterday, so mix and match and have fun! Hummus is very easy to make, plus it can be prepared in advance. All you need are garbanzo beans, oil, lemon and a few other ingredients. 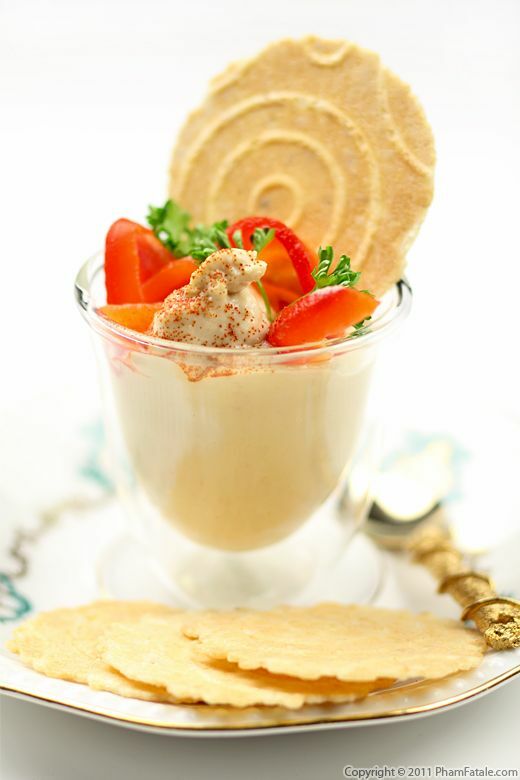 I made a batch today, and after whipping it together, I served the hummus in tiny cups and garnished it with roasted bell peppers and lemon crackers. If -like us- you host a lot of dinner parties, you might feel a little pressed for fresh appetizer ideas. My criteria for the perfect appetizer, besides being incredibly delicious, is that it doesn’t take an insane amount of time to prepare. I love to cook, but it’s (usually) more fun to spend time with your guests! 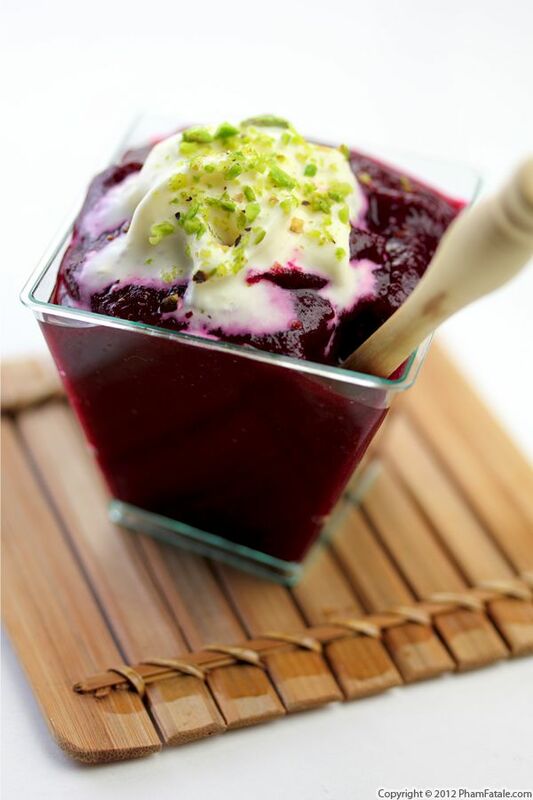 All you need is a simple recipe, the right ingredients and attractive, small containers to show them off. 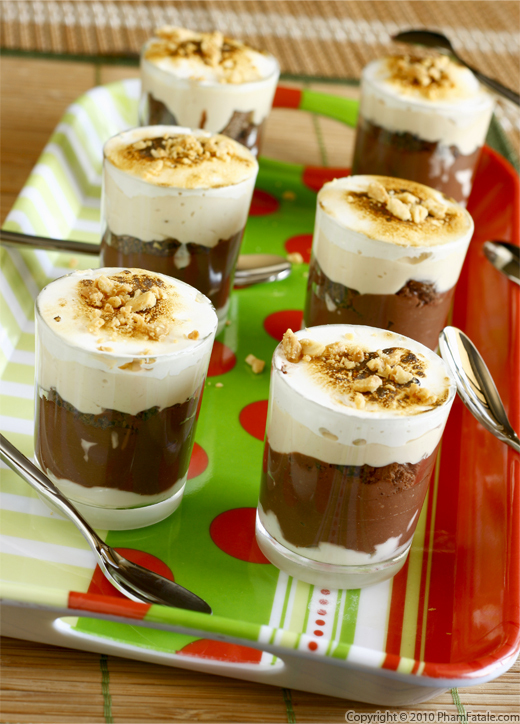 S'mores are a classic campfire dessert. 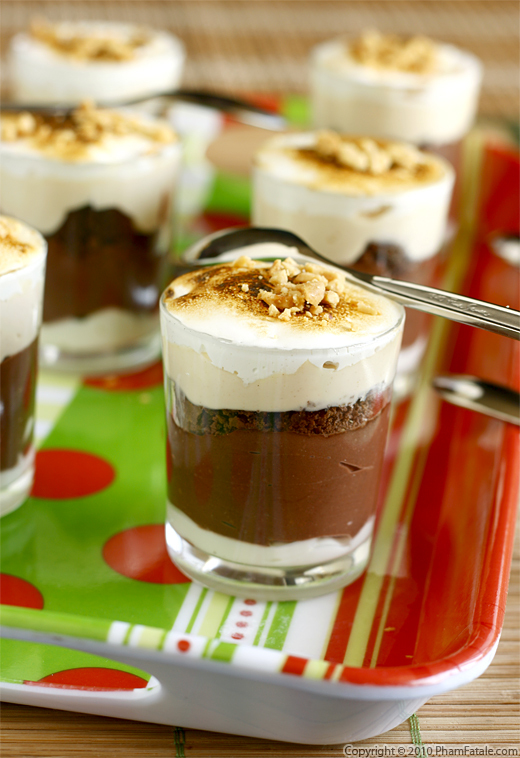 Generally, only chocolate, marshmallows and graham crackers are necessary for this American treat. As a French person, nothing symbolizes American desserts more than peanut butter, so I had to add some to the dish. This summer we decided to make use of a little outdoor fireplace on our property (we've been in this home for 6 years; I know we're pretty slow). We spent so many evenings roasting marshmallows and telling scary stories. I noticed the girls would smear chocolate everywhere, which makes the laundry not so fun. So I served these desserts in verrines (dessert cups). I don't know if making deconstructed s'mores reduced our laundry chores, but it tasted amazing! *The dessert was inspired by Chef Catherine Schimenti (Chef Michael Mina's pastry chef), which was served during the Sugar Party at SFChefs 2010.